This particular edition of the manifesto applies to academic libraries. The principles of stealth librarianship apply to all branches of the profession, each in particular ways. Other manifestos could exist for, say, public or corporate librarians. However the core is the same: to thrive and survive in a challenging environment, we must subtly and not-so-subtly insinuate ourselves into the lives of our patrons. We must concentrate on becoming part of their world, part of their landscape. And he ends by calling upon others to add their manifesto points. We at In the Library with the Lead Pipe saw this as an opportunity to respond to his list and create our own. Read on for our differing takes. 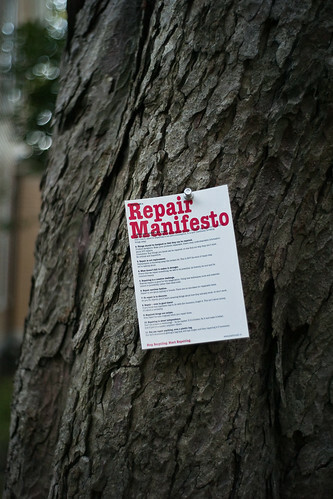 There are many things that I appreciated about Dupuis’s manifesto. What particularly resonated with me is his take on publishing and professional literature. We must stop reading the formal library literature. That’s what librar* blogs are for. We must familiarize ourselves with the literature and scholarly communications ecosystems of our patron communities. We must stop writing the formal library literature. That’s what librar* blogs are for. We must make our case for the usefulness of what we do in the literature of our patron communities. What Dupuis fails to mention here is that many academic librarians MUST publish in traditional, peer-reviewed library publications while striving to attain tenure. I am not personally in a tenure-track position, so I have the liberty of not fretting over where I publish. What I have found is that the online discourse via blogs is plentiful and satisfying for me to keep up with what’s happening in libraries. Blogging here at In the Library with the Lead Pipe offers me the opportunity to write and think critically in an open peer-review and open publishing format; it is a rich experience that creates and advocates for open discourse among professionals. I’m not so sure what “stealth” has to do when it comes to creating open discourse. Dupuis is contradicting himself. But Dupuis’s push toward understanding “scholarly communication ecosystems” resonates with me. Working as a Scholarly Communication Librarian, I see the work that needs to be done within academic communities in this regard. I see the education that needs to happen with faculty to understand even what is a “scholarly communication ecosystem.” To me that ecosystem is one stymied by the tenure system and traditional publishing paradigms. But without familiarizing ourselves regarding that discipline-specific system, how are we to educate our patrons regarding changes? Regarding open peer-review? Regarding peer-reviewed open access journals? Regarding using new measures like the Eigenfactor over Impact factors? And how are we going to make the case for changes in transparency and fairness of pricing from journal vendors if we don’t understand how a discipline-specific ecosystem works? Dupuis’s call for discipline-level understanding of scholarly communications is crucial for academic librarians. Despite my agreement with Dupuis’s manifesto points regarding scholarly communication, there are some points that I contend. My Lead Pipe colleagues have done a much better job addressing those contentions so I’ll end my piece with an offering of my manifesto bullet points for my praxis of librarianship. I will not be stealth. I will proudly and loudly be a librarian. I will not bend over backwards for my subject faculty, but I will engage with them and educate them about my profession, and in turn, learn about theirs. I will be open to new ideas. I will think critically about ideas and opportunities presented to myself and to my institution. I will acknowledge what I don’t know. I will continue to learn what I don’t know. I don’t think “A stealth librarianship manifesto” is about stealth at all. At least, not at its core. What Dupuis’s post really is about is much simpler and more nefarious: it’s about language. It’s about the way human beings — and in this case, scientists — perceive words based less on what they really mean and based more on their own various preconceived or culturally embedded ideas about them. Like “library.” What non-librarian doesn’t picture a quiet room full of overflowing bookshelves upon hearing the word “library”? There’s your problem, friends. And yes, I did really start thinking about this at Science Online 2011, with some ideas here and here. I also started germinating some of these thoughts after seeing how the library sessions at Science Online 2010 worked out, see here and here, noting how the session on Reference Managers was better attended and didn’t have “library” in the title. And looking further back, it’s a fairly common theme for my blogging, for example here and here. And yes, I did really start thinking about this at Science Online 2011, with some ideas here [“ScienceOnline 2011 Debrief Part 1: ebooks, blogs and stealthy librarians”] and here [“ScienceOnline 2011 Debrief Part 3: Some session ideas for #scio12”]. These two links point to past blog posts by Dupuis, both in response to the Science Online 2011 conference. “Debrief Part 1” is your basic conference debrief post, in which he comments on the fact that “science types” at this conference don’t attend sessions that have the word “library” in the title. Apparently Science Online 2011 included a very successful library session on “data discoverability” that was well-attended thanks to its avoidance of the “L-Word.” Meanwhile, “Debrief Part 3” describes Dupuis’s ideas for a future conference session he might organize to convince those science types that libraries really are great collaborators in educating students and advancing open science. Of course they need convincing since they don’t already know that libraries actually care about these issues instead of just being busy dusting off our old books. Why don’t they know that yet? Because we’re libraries. I also started germinating some of these thoughts after seeing how the library sessions at Science Online 2010 worked out, see here [“Science Online 2010: Scientists and librarians”] and here [“Reclaiming ground”], noting how the session on Reference Managers was better attended and didn’t have “library” in the title. These two links point to another blog, Book of Trogool, a Scientopia science blog written by what I’m guessing are three academic librarians (they don’t seem to have filled out their bios quite yet, alas). In “Science Online 2010: Scientists and librarians,” Dorothea Salo comes right out and starts battering away at the stereotype that forms the root of our language problem. “How,” she asks, “can science libraries persist when scientists haven’t the least notion that libraries or librarians are relevant to their work?” Salo then launches into her own sort of anti-manifesto listing all the activities that aren’t going to solve the problem, a cascade of angst that clearly inspired Dupuis to create his (more positive) manifesto. “Reclaiming ground” addresses the same problem through the lens of Steve Koch, an Experimental Biophysicist at the University of New Mexico. Commenting on his past negative experiences at his undergraduate and graduate libraries, Koch describes how, as a faculty member, he has been happy to avoid his library. Essentially his advice comes down to two points: “educate current faculty” about what libraries really do, and be nicer to current students so they like us better. Koch is getting at something behind the rhetorical theory I’m advancing, something at the very root of the library stereotype itself: libraries have a bad rap. Libraries have the reputation of being rulemongers, fine-collecting penny-pinchers, cranky about helping students, and all-around holier-than-thou. We know this is how (some) people see us, but is all of this negativity that weighs down the word “library” deserved? Koch’s experience would say “yes,” but I would contend that as a field librarianship largely attracts a different personality type these days that is less focused on institutional policy and more focused on customer service. Don’t you agree? (You can read more on librarian personality types here, though I’ll acknowledge that it doesn’t exactly back me up on this). So in that case, we’re back to the main part of the problem being the associations that go along with the “L-Word,” and not the libraries themselves. And looking further back, it’s a fairly common theme for my blogging, for example here [“Science in the 21st Century conference recap”] and here [“From the Archives: My theory of conferences”]. As indicated, these two links go back to previous posts by Dupuis that reflect both the originating concern of the manifesto and more context on one of its statements. In “Science in the 21st Century,” Depuis muses on another conference experience in which it was clear that science faculty did not have the library on their “radar.” This ties in cleanly with the other links described above. The second post, “From the Archives,” provides some background to his manifesto statement, “We must stop going to librarian conferences and instead attend conferences where our patrons will be present.” As one outreach (sorry, “stealth”) tactic, going to disciplinary conferences makes perfect sense. However, it’s not going to solve the problem. If only we could surgically trim the eons of expectation and stereotype from the definition of “library” in the brains of our patrons and leave them with a refined, sharper sense of what a library means in 2011. But how? Is it just a matter of, as Dupuis suggests, dropping the use of the “L-Word” in our work with those outside our field? What if we were to all consciously redefine our buildings and our jobs and our conference presentation titles to reflect the new work most of us do already? What if instead of saying I’m a “Librarian” I could introduce myself as a “Research Consultant” or “Information Expert” or — who knows? I can already picture the very different response that would evoke from faculty in other disciplines, as well as students. On the institutional level it’s already happening at campuses around the country, where libraries are being replaced with “Information Commons” and “Knowledge Centers” and a whole array of other non-L-word names. Perhaps it’s just time for us — as individuals and organizations — to completely redefine ourselves. That way, we can throw overboard the negative baggage our beloved libraries have been hauling around for all these years. I think I may be anti-manifesto in general. Or rather, perpetually and knee-jerkingly defender of whatever is under attack. I want to make it clear that I did read where Dupuis states himself that the manifesto is “a series of provocative statements not a realistic plan of action” and I appreciate the overall sentiment. But since this is a reaction piece, I have to admit, there is much I disagree with. A number of the statements start with “we must stop” and then follow with what we should be doing instead. I agree with most of the ‘start doing’ items, but I don’t see these as either/or choices. There may be some aspect of “what are you able to give up to add in these new important things,” but I don’t think most of the items should actually be fully stopped by all librarians. I also see many of them as comparing apples to oranges. The things gained from librarian/librarian interactions are what we then use in our librarian/constituent interactions. They serve different purposes and they’re not interchangeable. For example, we can learn from our constituents what programs or services most interest them, but we can’t learn survey methodology from them. And what about all the times their personal interests conflict with our mission? We are in a profession where we have to sometimes ask, do we give them what they want, or what they need? A friend posted a quote on Facebook from a student after an information literacy session, “you should just talk not ask so many questions.” It is our deeper interactions with fellow librarians through conferences, workshops and our literature that enrich our teaching pedagogy. Twitter and Facebook can supplement that, and can build wonderful connections, but they can’t substitute. Much of the manifesto seemed to be based on an assumption of a large staff of librarian subject specialists, which is often the case at large research institutions, but may not be. If I’m in charge of all the purchasing for my small college, or only do instruction, or cataloging which single conference has my patrons? Which scholarly publishing ecosystem do I need to learn? I would argue it’s the librarian conferences where we bring together these jack-of-all-trades elements. I do agree with the focus on faculty in academic institutions. Study after study shows that faculty are among the first people students contact for help and libraries and librarians are at the end. We can certainly do more to work with faculty to help students. Every situation is unique and we each need to evaluate our own community and resources. Hopefully our decisions are informed by best practices (from the library community) and user studies, but ultimately there is no one right answer. For example, there was a time I would have agreed with Emily’s statement “down with database demos.” But I will do an instruction session with no critical thinking component because at my institution the English as a second language professor wants to bring her developmental reading students in to show them how to find books in the library catalog and to introduce them to the expectations of an academic library. I will let them know they’re allowed to bring in drinks as long as they have a lid and that they can print 15 pages a day. We will search for books in the catalog and learn how to use an LC call number to find a book on the shelf. Then we’ll walk over to the shelves together and over half the class will check out a book, leaving with something that will help them improve their reading skills and feeling more confident about their ability to do so in the future or at least more confident in approaching the friendly lady at that big desk. They come in looking like deer in headlights and leave smiling. And that has every bit as much value as working on critical thinking skills with students who are at that developmental and affective stage. Last week, I participated in Texas Library Association’s Legislative Day, a full day of visits with state legislators to talk about issues in libraries. We visited the offices of every single state representative in the House and the Senate. This year there’s a lot to talk about when it comes to libraries and the draft 2012-2013 biennium budget. Long story short, state library programs including TexShare (how we can afford databases like Academic Search Complete), Interlibrary Loan, the K-12 database program, and a variety of others are completely obliterated. We’re not talking about steep cuts – we’re talking about zero’ing out entire program budgets. The conversations we had with state legislators and their aides made it clear why programs that are so obviously vital to us are on the chopping block: legislators have no idea what libraries are or what we do. Academic, public, school or otherwise. School libraries and certified school librarians are critical in supporting education and digital literacy. School librarians are teachers and should be recognized as teaching staff… School librarians are frontline teachers who instruct students everyday on curriculum requirements, such as how to research, locate, evaluate, cite, and use information effectively and ethically… Certified school librarians must hold a master’s degree, pass a graduate level exam on library media functions and supporting school curricula, and have two full years of classroom teaching experience. Time and time again, we ran into legislators who believed librarians were part of the non-instructional staff in K-12 schools, adding to the administrative bloat public schools carry. It’s no wonder libraries and librarians have taken a beating in the draft budget. Our representatives don’t understand what we do. And here we are, at the eleventh hour, trying to plead for our interests and those of our patrons, with people who are far more interested in other state matters. The outlook is bleak for Texas libraries. We did the best we could at legislative day, but it all seemed like it was too little, too late. As Dupuis would have put it, we are not part of a legislator’s landscape. We’re barely a part of our user’s landscape. This speaks to the spirit of the manifesto in that we must be “on the same side” or “of the same group” with our users. We can’t be the “other” if we want people to stand up for what we do. We must develop an environment where a threat to the library feels very much like a threat to its users. Run a “What My Library Means to Me” project. Make your library their library. Do it stealth. Do it in the open, purposefully. The most important part is to do it, and share your results with a senator, a provost, a principal, a superintendent or a mayor. Note: A big thank you to Gloria Meraz, Director of Communications for the Texas Library Association, and all TLA staff and volunteers who put together legislative day this year. The message Gloria composed for us to share was lucid, urgent, and timely. It gave us words for what we know to be important for our state. Thank you! Is anyone trying to stealthily infiltrate the librarian community? I’m pretty sure the answer is no. Why? In part, because far too many librarians think we should ignore what we’re good at (whatever that is, right?) in order to pretend we’re something else entirely. Nursing isn’t what you turn to when you fail at getting into medical school. Social work isn’t what you turn to when you fail at getting into a psychology program. Education isn’t what you turn to when you drop out of a PhD program. Librarianship isn’t what you turn to when you want to stealthily sneak onto the faculty. These are professions and academic disciplines with a history all their own, each with a fascinating, useful, unique body of knowledge. If we can keep this idea in mind, maybe it will help us muster enough self-esteem to start reading (and talking about) our professional literature and to continue the work of making our professional organizations truly relevant. We have a lot of work to do, a lot of questions to answer, but that work can be made easier by paying attention to the librarians who have thought about these questions already and who have contributed their ideas and their research to our professional literature. Our work can also be made easier by working with others in the profession and by bringing in people from related professions to help us along. Figure out what the students and faculty need in order to do their work. This is just an educated guess on my part, but I’m pretty sure that figuring out what students and faculty want and giving it to them means putting every available resource into improving the library’s website. And by website, I don’t mean just the pages in www.library.yourinstitution.edu, I mean every resource and service students and faculty access through the library website or could conceivably access through the library website. Do you want to do something stealthily that I, as a student, would find really useful? Learn information architecture, learn to program, or figure out how to negotiate contracts with the content vendors that allow programmers and information architects to present information in a usable way. I don’t need to see you at my conferences or on my turf or collaborating with faculty members or in my “patron community” and I’d really rather you weren’t “in the social networking spaces where (we) live”: I just want the library website to work. As far as I’m concerned, any effort to go stealth is wasted. The problem isn’t with our public relations. The problem is with our product. Did someone say “public library manifesto”? Where to begin? Dupuis is correct when he states that a manifesto for public library workers might look very different. Many of the problems with which he takes issue are not relevant to public library workers because of the nature of our institutions. Most public library workers, for example, do not gain any sort of professional favor for presenting at conferences or serving on committees. Participation in these activities does not net us better wages, promotions, or tenure, and is not work that is routinely valued in the public library sphere, unless one currently occupies a management position or has self-identified as “management material.” In fact, it is all too frequently seen as busywork that takes reference librarians away from the day-to-day operations of the library. Whether or not this is an acceptable state of affairs is for wiser, more experienced heads than mine to determine. However, given the current state of public librarianship, here are the revisions I would make to Dupuis’s manifesto. May they initiate a spirited conversation about the professional work of the public librarian, and the best way to support it. Public library workers must be selective about which conferences they attend and which professional associations they join, supporting only those that specifically support our particular needs and concerns. That being said, public library workers must make an honest attempt to reform unsatisfactory professional associations before giving up on them. Public library workers must have an elevator speech for their job/institution and be willing not only to deliver it at the drop of a hat, but to tailor it on the fly based on the particular needs and interests of the audience. Whenever possible, public library workers must collaborate with academic and special library workers to create interdisciplinary services for the community they collectively serve. Public library workers must blog, using their real names, and with full support from their institutions. Our unique voices and experiences are still, sadly, underrepresented. Public library workers must re-imagine what professional literature could be, and actively seek out opportunities to write for publications, print and digital, that our patrons are reading. Public library workers must make an honest effort to explore leadership and management opportunities before rejecting them as unsuitable. By the same token, public library workers must firmly reject any such roles and opportunities they have tried and found wanting/inappropriate, for whatever reason. While there are a great deal of factors over which we have no control, I reject out of hand any theory of public librarianship that smacks of self-pity or victim mentality.There is so much that we are already doing quite well. We routinely partner with non-library organizations in our communities to host programs, especially for children and seniors. We actively court teen clientele and try to understand their unique perspective. We use social media wisely, for the most part, and our reputation for defending the freedom to read is legendary. I refuse to believe we cannot apply the same spirit and fire to the cultivation and development of our collective professional identity. Or, to put it another way, time to take the logs out of our own eyes before tackling the specks that trouble our patrons. At the very least, we should be conscious of those thoughts and behaviors that prevent us from constructing a solid professional identity, and initiate conversations on these matters, no matter how difficult that might seem in the context of our institutions as currently constructed. Full disclosure, dear colleagues: I am writing my portion of this post on my own time, at an ungodly hour on the night before it is due. I do this not because I am a martyr, or because I hope someone influential will see the essay and be impressed by my dedication to our profession. I do it because I refuse to accept the tired old dichotomy that shunts scholars into one arena and practitioners into another. It is not enough to serve the public. We must have a theoretical-rhetorical model that serves our own best interests, and makes it easier to explain our value to a culture that delights in questioning it. We must have a body of professional literature that is meaningful and vibrant. And, above all, we must have library workers who actively and consciously explore their gifts and abilities, then select appropriate vehicles for expressing those abilities. Public library workers of the world, unite and write! You have nothing to lose but your stereotypes. I agree with Ellie; “musts” disturb me. It’s an intentionally provocative piece, though, so I’ll give him the benefit of the doubt. ^_^ It helped for me to read it as a list of suggestions for change in focus. I like the overall theme of int…egrating librarians into governance. That would be hard to do stealthily, though. I’m a bit more wary of dropping the “L” word from the profession. The term doesn’t just bring baggage, or maybe a better phrasing would be that not all of the baggage is negative. IMHO, much of the profession’s political and cultural power goes hand in hand with the evocation of “library,” and I think that aspect is overlooked a bit in some of these discussions. So- I promise I’m not just saying this because I’m mostly an academic :P- the idea of ignoring formal library literature really, really disturbs me. In one of my own areas of focus, copyright and libraries, blogs aren’t sufficient. I read blogs and I write blogs, and the ones I read are *tremendously* helpful, but they’re not enough to understand the complexities of the issues involved. They’re not always enough to engage in informed conversation with people, particularly those outside of the profession. I use blog readers, Google alerts, subject Web sites, journal Web sites, news/popular articles, books, Facebook, Twitter, and more just on this relatively tiny issue related to librarianship, and I’m still pretty sure it’s not sufficient. :P The library literature is part of that overall ecosystem, though. I’m *also* in favor of “understanding [the] scholarly communication ecosystems” of patrons. “1.Figure out what the students and faculty need in order to do their work. Active and correct assessment of libraries is a deeply necessary step and more measures of ROI need to be generated so that libraries, esp. non-research ones have quantifiable methods for demonstrating the investment that the institution or community is giving is worth it. Because giving it to them, while easy to say, can be much harder to do based upon the amount of resources available. I work as a solo librarian, for a small college in upstate NY. The economic situation in the state and nationwide has directly affected my library budget where I can’t provide everything that students and faculty want, right now. But I think I can provide enough to maintain their faith in the library until, hopefully, the budget nonsense is resolved. One of my manifesto points is, especially for my library users, is working to develop and retain their trust that the library can provide the correct resources for the students,staff and faculty every single time. I’m not there yet. But it’s getting better because I go, physically/digitally, to the students and faculty and say what do you want, how can we get it and how are we using what we currently have? As a public librarian, I SO appreciate Leigh Anne’s section, particularly the end. “…I refuse to accept the tired old dichotomy that shunts scholars into one arena and practitioners into another. It is not enough to serve the public. We must have a theoretical-rhetorical model that serves our own best interests, and makes it easier to explain our value to a culture that delights in questioning it.” Don’t have anything more intelligent to add at the moment, but I totally agree.